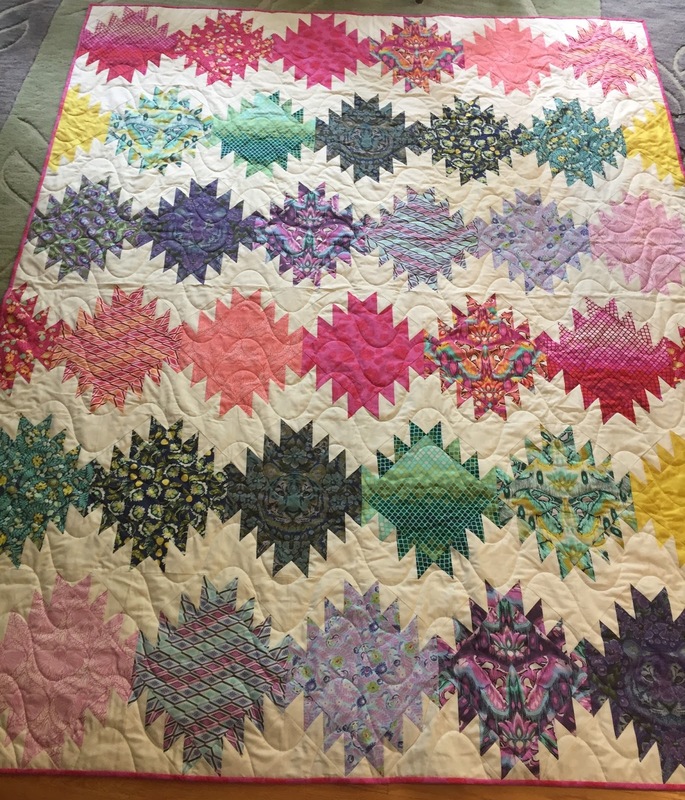 This is my Simply Eden Quilt, fabrics and pattern by Tula Pink. The construction of this quilt involved a lot of fussy cutting, so please take note of the butterflies and tigers, which are right side up. I quilted this with a sine wave, and even though that's a very simple and elegant curve, it taxed my knowledge of the software to pull it off. In the end, I was victorious. Lisa Teichman of Garden Gate Quilting is an inspiration to me. She has been posting on her social media sites a regular feature, "On The Frame Today." 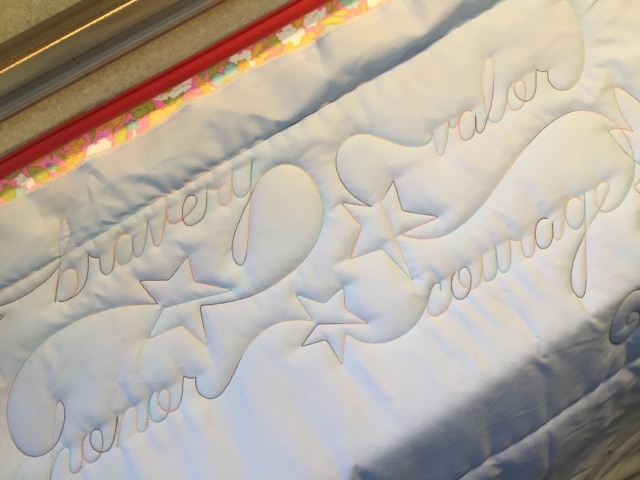 As a professional quilter, there's something new on her machine almost every day, and I wouldn't be surprised if there's more than one quilt on some days. I am no professional, but I will try to post a photo of what's "On the Frame This Week." 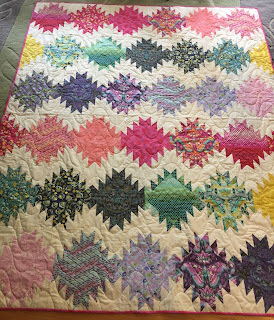 This Scrappy Stars Quilt has been in my "to quilt" pile since 2012. I thought it was an inconsequential quilt, but as it was being stitched on my machine, the various fabrics woven into it reminded me of happy quilting adventures in the past. The fabrics are from my first five quilting years. It just goes to show you that the memories we create while doing what we love are always waiting there in the cobwebs to infuse a little thread of unexpected joy. So, keep doing what you love! I quilted a lovely charity quilt for a woman in the Bronx. This one is going to go to a WWII veteran. I fear there are very few WWII vets left among us, and I was glad to be reminded of the sacrifices made and (hopefully) lessons learned during that heartbreaking and tragic war. Heroes were quietly working in the background to save those in peril, and villains were found among the meek. May the man or woman who deserves this token of our gratitude be blessed with peace and joy. I have ventured into the world of purchased quilting designs! I know, it's not that big a deal to buy stuff that other people created, but downloading and importing were new to me, and getting this design quilted out on scrap felt like an accomplishment. 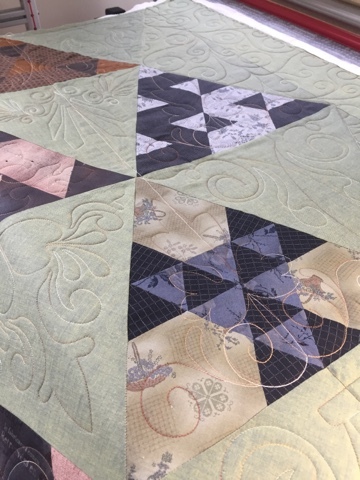 The "morph" feature of the software on my Innova quilting machine enabled me to turn corner triangles into equilateral triangles. The geometrist in me is rejoicing!!! Check out the early stage quilting of this, the 2015 Quilted Threads Block of the Month, Toes in the Sand.